This week I traveled back to New York City by the way of the Harper’s Weekly, October 7, 1865 . 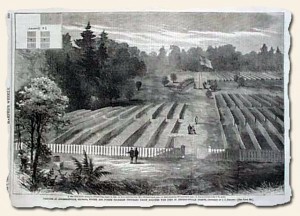 Although this issue is filled with a variety of woodcuts [illustrations], the one that struck me the most was of the “Grounds at A ndersonville, Georgia, Where are Buried Fourteen Thousand Union Soldiers Who Died in Andersonville Prison” and the accompanying article. “…The graves of the soldiers starved and poisoned and brutally murdered there are not scattered about over the innocent hill-sides of our land, but are dug under the sod that drank their blood and bore witness to the cruelty of Wirz, Winder, and the rebel authorities at Richmond, who kept these demons at their posts… James M. Moore,Assistant-Quarter-master, and his party, returned from Andersonville, where they have been engaged for a month in identifying the graves and giving honored sepulture to the fourteen thousand victims of rebel barbarity, who suffered all manner of torture and death in that notorious prison-pen…”.